I love vampires. I have a particular disdain for the teeny bopper, heart throb vampire genre that seems to be all the rage. I love my vampires to be ugly monsters inside and out. I want my vampires to be the sort that none of us would ever imagine being. I knew when I first read The Strain novels by Guillermo Del Toro and Chuck Hogan that I would be getting those kind of vampires. Del Toro knows evil and he beautifully manifests that evil in the vampires we find in The Strain. I was grateful that it was bought to the cable screen. When it was published as comics, I was very geeked. What really drew me into The Strain is how Del Toro and Hogan tie the vampires to biology. It adds more terror to the story. The vampires are sustained by these worms that seem to survive all conditions to infect other hosts. So while someone can kill a vampire, one worm that can sneak onto clothing without anyone noticing is enough to infect a human. This is what sets this vampire story to others. This little detail makes the story a little more realistic on the science level. It also makes potential victims more afraid of these vampires. At this point of the story, the vampires have pretty much won. The Master has subjugated the world and made it in his image. While many humans are just cattle, there are several others who are allowed to continue on with their lives. This helps to maintain the status quo. By using nuclear weapons, the Master has blotted out the sun throughout most of the world, allowing his minions free reign. There are only a few hours of sunlight each day. This is just enough to give rebel factions enough time to move about. The vampires in The Strain are monstrous on so many levels. Mike Huddleston’s artwork captures his monstrosity. Even the humans who are kept alive to be drained for blood look hideous. Huddleston even portrayed the vampires in various forms of decay. The humans who side with the vampires for their own gain are also drawn in a hideous manner. On top of that, Dan Jackson’s colors adds an overall gloominess to the entire background. This helps convey the idea that humanity is doomed. Even if the reader witnesses a human slay a vampire, the dreariness of the area displays a sort of despair that was borrowed from the source material. David Lapham’s scripting also borrows the overall mood from the source material co written by Del Toro and Hogan. Lapham’s pacing is perfect. The source material is vast and the comic adaptation under Lapham does a great job. 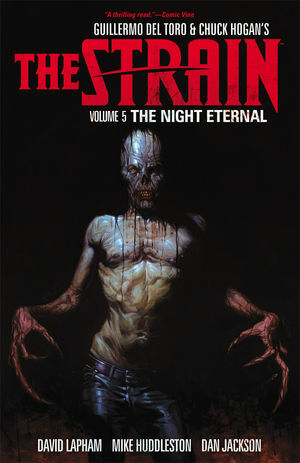 I doubt any fan of the Strain will be disappointed. Even if one is unfamiliar with the book or the cable show, the comic series is a great way to get into the universe.